Hosting an International theme party is simple when you start with International Flag tableware. The bright colors of the international flags adorn the paper plates and napkins from edge to edge. We offer two different sizes of International flag paper plates and two sizes of International flag napkins so you can pick the perfect size if you are serving hearty meals or sampling International snacks. Then have your guests wash it all down with the International Flag Hot/Cold Cups which are suited for either a cool beverage or a German hot chocolate. Don't forget to dress up your table in the International flag theme. We have a plastic International Flag Tablecover that not only looks great, but it makes cleaning up any spilled spaghetti a piece of cake. Or, if you want to add just a little bit of color to your table, select the Printed International Table Runner. 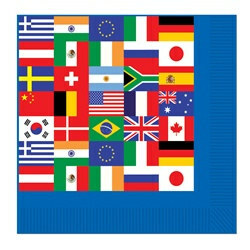 Browse all of our International Flag Tableware to see what will work for your party! Check out our full tableware collection for mixing and matching possibilities! 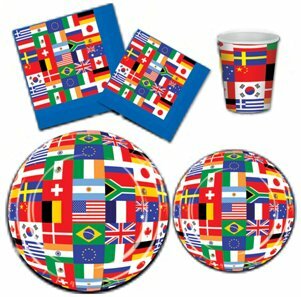 The international flag tableware is great for mixing and matching with any country's theme for a party. This tableware features the designs of flags from a plethora of countries. International party decorations and tableware make for great additions to cultural events. These items could also be fun ways to dress up a school project that studies different countries' cultures and histories. The items could also decorate a welcome party for foreign exchange students or for a welcome home or going away party students sent from your own home school. Mix and match the international items with the items from individual countries for indication of origin and to be more visually appealing. For example, in a large multi-cultural event, you could decorate a table about a particular country with its own flags and symbols while keeping your main seating areas and eating spaces decorated with the more inclusive international items. Load up our International Flag Lunch Plates with all the exotic cuisine offered at your event! One can never forget dessert, so be sure to serve up sweet treats on PartyCheap's International Flag Dessert Plates! You can also check out our full tableware collection to find solid colored items or other things to match your unique theme! Enjoy all the possibilities with PartyCheap.com!